Strong women of mind and heart. Where do your strengths lie? Whatever your academic and extracurricular interests, at Marian, you will explore and discover new strengths. Marian students are encouraged and supported by faculty, staff and each other. They find confidence in their abilities, feel empowered to challenge themselves and grow in their faith. They learn to lead from within. Come find your strengths at Marian! Marian helps create strong women of mind and heart. As one of the best private and faith-based schools in southeastern Michigan, Marian High School helps students become women who lead from within. More than just a high school, Marian is a community that helps young women develop a strong core of wisdom, character, and service that will guide them throughout their lives. The Marian Rice Players are revving up for their spring musical production of West Side Story. Marian High School is hosting a College Night, Thursday, March 14, 2019, from 6-7:30 PM in the Marian gymnasium. This event is MACRAO-sponsored (Michigan Association of Collegiate Registrars and Admissions Officers), and all area high school students and parents are welcome to attend. Marian High School, founded in 1959, has dedicated itself to providing an exemplary Catholic college preparatory program for young women. Accredited by the AdvancED Coommission on Accreditation and School Improvement, the academic program offers many opportunities for academic and intellectual growth by providing college preparatory classes, honors classes, and Advanced Placement courses. Leadership and community service experiences are embedded in the life of the school. Become a stronger team player. Why does Marian win so many state championships? It’s teamwork. Championship teams are built by working together. Marian athletes are not just stars in Michigan sports, they win in life, learning commitment, accountability, and faith in the journey. Two Marian High School seniors recently made college commitments. Sophia Schott and Kailyn Swantek signed national letters of intent to swim in college. Sophia signed with Northwestern University, and Kailyn signed with the University of Pittsburgh. Become stronger in faith. Marian is a Catholic school that welcomes students of all faiths. Campus Ministry offers experiences that support students in their spiritual growth and engages them in leadership and service both in the school and around the Metro Detroit area. Become a stronger leader. All-girls’ schools provide more opportunities to lead. At Marian, every student can customize a mix of co-curricular activities so she can find her strength and let it shine. Whether it’s student government, the arts, community service, or something else, Marian provides leadership opportunities for all. 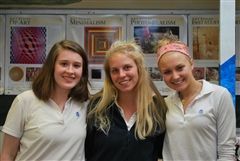 Three Marian High School art students won top awards at the “Care for our Common Home” juried student art exhibit, sponsored by the Sisters, Servants of the Immaculate Heart of Mary. The exhibition, held in conjunction with Earth Week, follows the environmental theme of Pope Francis’ encyclical Laudato Si. The art exhibit runs at the IHM Motherhouse in Monroe, MI through May 22. Perhaps you can’t be 17 again. But you can feel like it. When you reconnect with Marian, with old classmates and current students, you’ll be surprised how young it will make you feel. Whether your hair was a bouffant, teased, permed, long or in a sloppy bun… Whether you listened to folk rock, hard rock, alternative, R&B, rap or grunge…Whether you wore your plaid skirt long or rolled it short… Styles come and go, but the heart of Marian is still the same. And if you have a little place in your heart for Marian, for the girl you used to be, and how it shaped you in part to be the woman you are now, we invite you to come back. Get involved. Volunteer your time. Share your wisdom. And give what you can to ensure Marian will be strong for generations to come. Our alumnae, parents, faculty/staff, and friends are critical to the success of our giving programs. As we shape the future of Marian High School, we ask that you continue to invest in Catholic education for our young women.